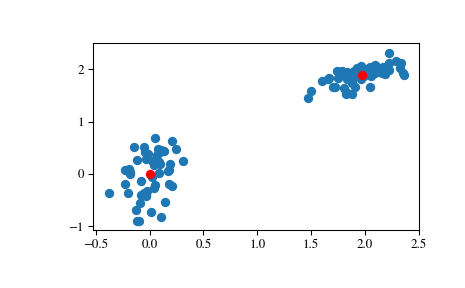 Performs k-means on a set of observation vectors forming k clusters. The k-means algorithm adjusts the centroids until sufficient progress cannot be made, i.e. the change in distortion since the last iteration is less than some threshold. This yields a code book mapping centroids to codes and vice versa. Distortion is defined as the sum of the squared differences between the observations and the corresponding centroid. Each row of the M by N array is an observation vector. The columns are the features seen during each observation. The features must be whitened first with the whiten function. The number of centroids to generate. A code is assigned to each centroid, which is also the row index of the centroid in the code_book matrix generated. The initial k centroids are chosen by randomly selecting observations from the observation matrix. Alternatively, passing a k by N array specifies the initial k centroids. The number of times to run k-means, returning the codebook with the lowest distortion. This argument is ignored if initial centroids are specified with an array for the k_or_guess parameter. This parameter does not represent the number of iterations of the k-means algorithm. Terminates the k-means algorithm if the change in distortion since the last k-means iteration is less than or equal to thresh. A k by N array of k centroids. The i’th centroid codebook[i] is represented with the code i. The centroids and codes generated represent the lowest distortion seen, not necessarily the globally minimal distortion. The distortion between the observations passed and the centroids generated. a different implementation of k-means clustering with more methods for generating initial centroids but without using a distortion change threshold as a stopping criterion. must be called prior to passing an observation matrix to kmeans.